Last week, I wrote a post on Visually about the conceptual and design process behind The Graphic Continuum. In this post, I want to share some of the sources of inspiration for the project. I developed The Graphic Continuum with two goals in mind. 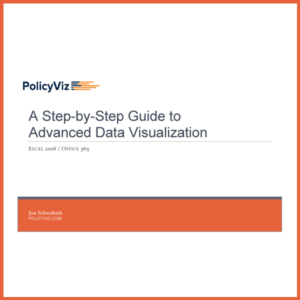 First, I wanted to provide a data visualization classification system as you consider different ways to show your data. Second, I wanted to create a tangible product that you can hold and look at; not just an infographic sitting on a website, but something you could put on your wall and use in your own work. 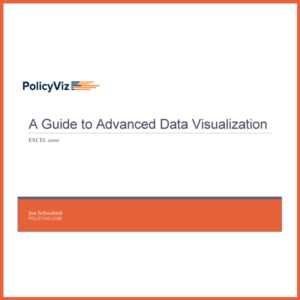 For help on the creation side, I teamed up with Severino Ribecca, who created and runs The Data Visualisation Catalogue. The Graphic Continuum is not the first graphic classification system. I drew on a variety of different sources; some to help us determine a reasonable classification system and others to inspire the kinds of graphs I wanted to include. There are, of course, many, many other sources of inspiration, so apologies if I left your work off the list. 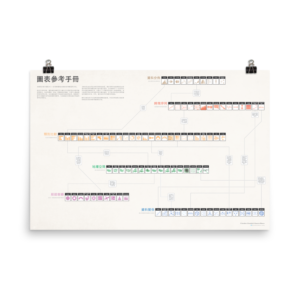 Andrew Abela’s Chart Chooser may be one of the more famous classification systems. 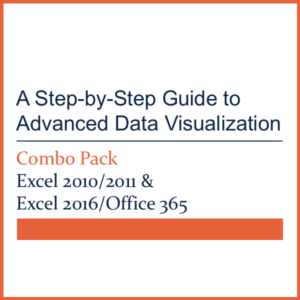 It breaks data types into four separate categories, mapping those data types to 19 unique graphs. 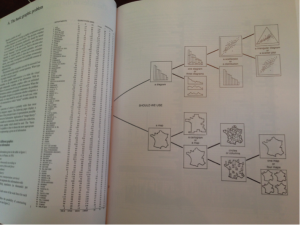 Jacques Bertin’s book, Semiology of Graphics, includes a couple of classification systems (see picture). Jorge Camoes’ A classification of chart types divides graphic types into two major (and six minor) categories: Data comparison charts (Comparison, Composition, and Distribution) and Data reduction charts (Evolution, Relationship, and Profiling). 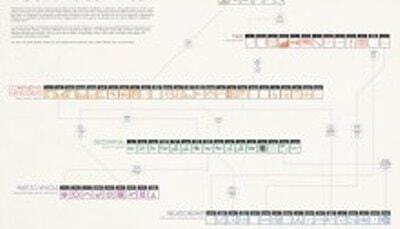 He includes 27 separate graphs in his classification system, including some less common types such as a cycle plot. Juice Analytics has a Chart Chooser that includes 17 different charts, divided into six different categories (comparison, distribution, composition, trend, relationship, and table). This set of slides from Andy Kirk includes some of his view about classifying graph types. There are some kinds of graphs that are so common, I didn’t need a lot of research: columns, bars, lines, pies, scatterplots, and so on. Others are less common, but still just as useful: dot plots, slope charts, horizon charts, and chord diagrams, to name a few. I used a number of resources to find other graph types and refine what I felt we needed to include. Robert Harris’s book, Information Graphics: A Comprehensive Illustrated Review, includes a number of different groups and classifications of chart types. Noah Iliinsky has a Properties and Best Uses of Visual Encodings table. We were initially going to include a variation on this table in a side bar to the poster, but it didn’t make the final layout. Manuel Lima’s books, The Book of Trees and A Visual Bibliography of Tree Visualization, gave me a lot to consider when it came to tree visualizations. David McCandless has a small table/infographic in his book, Information is Beautiful that includes some less common graphic types. Catherine Mulbrandon has a somewhat similar Graphic Elements ranking system that she presented with me at a conference a few years ago. There are a variety of data visualization resources related to Preattentive Processing, including Chapter 6 of Alberto Cairo’s book The Functional Art, Isabel Meirelles’ book Design for Information, and a great article by Stephen Few called Tapping the Power of Visual Perception. Santiago Ortiz’s presentation at the 2013 OpenVisConf helped me think about how to talk about this space. 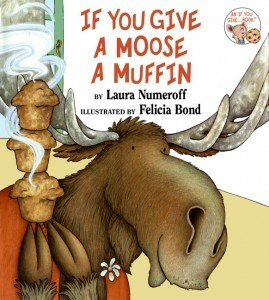 Finally, because I often talk about this project in front of audiences, I would be remiss not to include the inspiration for the structure of that talk: Laura Numeroff’s terrific book, If You Give a Moose a Muffin. 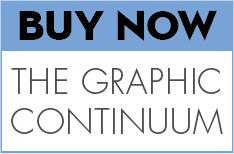 If you’d like to hear me present The Graphic Continuum to your team, please drop me a line. And, of course, if you’d like to buy The Graphic Continuum, it’s now for sale.